By default users cannot see or edit any metadata fields. Metadata fields configuration allows you to define which fields are viewable and editable for a user or group. This setting applies to all assets a user can view. 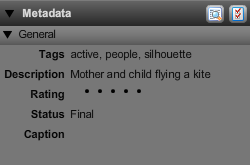 Additionally, the 'edit metadata' permission on rules allows you to define for which assets metadata is editable. Let's take the example of a designer who is allowed to edit the value of the metadata fields 'status' and 'rating', but only on assets that have the current value 'Production' for 'status'. First assign view and edit rights to the correct fields in the "Metadata Fields" tab in "Manage Permissions". Then assign the edit metadata permission for the group Designers on the rule status:Production. 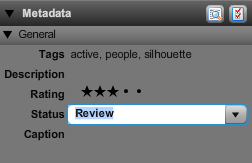 The result is that on the image with status "Production" the metadata can be edited by the designer, setting the status to 'Review" and adding a rating. But the designer cannot edit the metadata of an image in status "Final".